Coeus Age unveiled 9 predictions for eGovernance for 2019 at their annual Best of Tech Research Briefing Session. The event, organized on the 15th of March, 2019 at The Claridges Hotel, New Delhi, was attended by 65 Government and Industry Tech leaders. A very interesting discourse was set on the emerging technologies and their implications for eGovernance. It was no ordinary conclave, it cohered around the central theme of emergence of Autonomous Governance by the Triple Play of Automation, Analytics and AI. It unfolded in the form of research briefing by Dr. Kapil Dev Singh, CEO, Coeus Age, industry keynote by Shri Saurabh Saxena, Country Director, Micro Focus, followed by an engaging panel discussion. The panel discussed was graced by Smt. 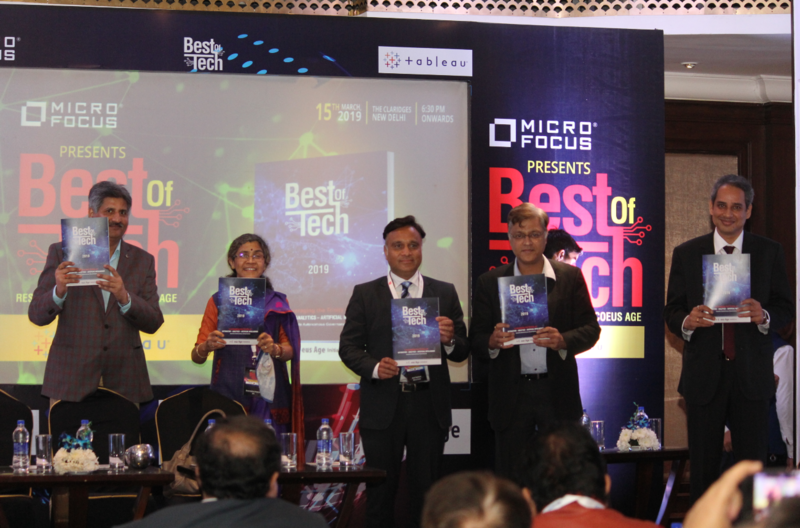 Sharmistha Dasgupta, Scientist F, NIC; Shri Golok Kumar Simli, CTO, Passport Seva Project; and Shri Vishnu Chandra, DDG, NIC from the government, and Shri Amit Naithani, Director – Government & Public Sector, Micro Focus and Shri Prashant Momaya, Head- Technical Sales, Tableau, from the industry. We shall present the debate through a series of articles. In this article, we present the 9 predictions by Coeus Age. The predictions are an outcome of a three pronged research – survey of 52 government tech leaders, expert perspectives by 12 senior government tech leaders and Coeus Age repository especially 92 case studies of Gems of Digital India. 1. Focus on basic automation shall further intensify, there is no end when it comes to automation. 2. Cross domain integration shall gain stronger traction, especially in matured domains. 3. Citizen experience will get its due consideration, yet actions may remain limited. Consider it the right time to show quick successes. 4. The first wave of digital (SMAC) shall gain further ground, especially cloud. 44% of government tech leaders stated cloud as their priority for 2019. 5. Analytics is emerging as the next stop, 71% of Government Tech Leaders have stated this as their priority for 2019. The focus, however, may remain on creating basic dashboards. 6. Artificial Intelligence will see green shoots, but may not gain momentum. It’s the time to discover use cases and build POCs. 7. The recursive cycle of automation – analytics – artificial intelligence will kick in, yet their play will largely remain discrete. Over time they shall cohere into a more unified entity, something that will redefine eGovernance for citizen centrality. 8. Amid slow-paced search for a new enterprise architecture, ground softening shall begin. 9. Focus on crowd sourcing and GovTech start-ups will remain marginal. A report by Coeus Age was launched at the event, which will be available for your perusal very soon.